After another hugely successful and unforgettable event last summer Field Day will be expanding to a two day event in 2014, held on Saturday 7th and Sunday 8th of June 2014 at its home in Victoria Park in the heart of East London. Headliners Pixies and Metronomy will be joined by a variety of acts including Drenge, Blood Orange, Danny Brown, East India Youth, George Fitzgerald, Ghostpoet, Jagwar Ma, Sky Ferreira, Tim Burgess and Warpaint. 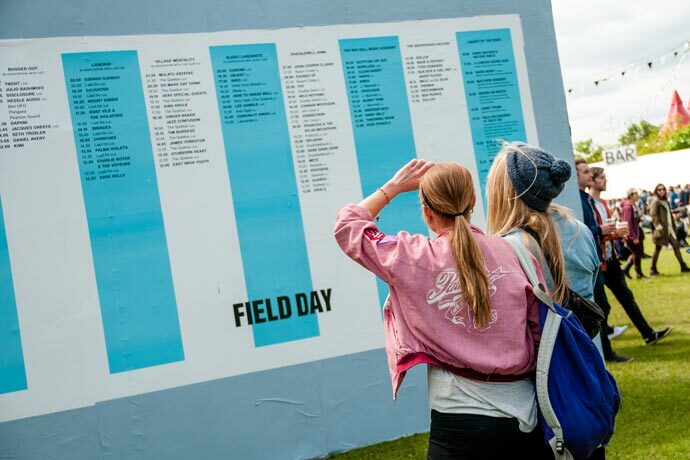 As with years gone by, Field Day provides entertainment for those looking for respite from the music in the Village Mentality area on The Village Green. Expect traditional side stalls inspired by country pastimes and weird and wonderful fete games such as sack racing, tug-o-war, tea bag tossing, winkle picking competition and last year’s highlight: the Nettle Eating Competition. Location: Victoria Park, Grove Road, London E3. How to get to site: There are no parking spaces at all in the immediate vicinity of Victoria Park, don’t bring your car, but use public transport/your bike instead. Beer Prices/Selection: London Prices. The London Brewers’ Market will be appearing at Field Day for the first time in 2014, presenting a round up of the very best of London’s craft brewing scene. Campsite: None, but you could always stay at the Ritz. Clientele: Strong indie dance vibes going on. Acts that have played before: Bat for Lashes, Disclosure, Daughter, Seth Troxler. Other stuff to do: The festival seems to be mainly about the music but there’s a strong emphasis on good food and drink including Street Feast, London’s pioneering night street food market, London’s best independent award winning food markets – Venn Street Market and the London Brewers’ Market. Also expect to find the Tim Peaks Coffee Bike, the public service coffee machine. Ticket Prices: Saturday: £49.50, Sunday: 38.50, Weekend: £78. Security Staff: Usual festival style.